Lately, Gomal University publishes two research journals namely "Gomal University Journal of Research" and "Gomal Journal of Social Sciences and Humanities. 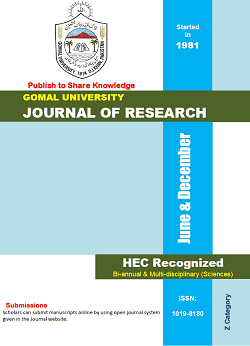 Keeping in view the growing need of research in various disciplines, Gomal University Journal of Research has been dedicated to publishing quality research in Basic and Applied Sciences whereas, Gomal Journal of Social Sciences and Humanities has been dedicated to publishing quality research in Social Sciences and Humanities. In order to facilitate authors and meet the HEC's criteria, both the journals operate online via Open Journal System. Gomal University Journal of Research is H.E.C recognize multidisciplinary journal publishes articles in natural and applied sciences. 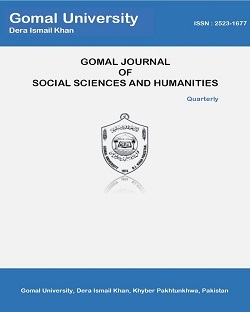 Gomal Journal of Social Sciences and Humanities is the emerging journal of Gomal University, publish articles in social sciences and Humanities domain.